Blood vessels are continuously exposed to various stresses such as mechanical strains and neurosignals. Besides its role of barrier between blood and other tissues, the endothelium is a cell layer highly important for the regulation of vascular tone. Indeed, depending on the signal perceived by the endothelial cell, it can drive a vasoconstrictor or vasodilator signal. In this review, we will focus on the mechano-receptors and neuro-receptors which lead to the vessels relaxation via the production of nitric oxide. In a second part, we will give some evidence of a potential cross-talk between these two kinds of perception. Different types of vessels such as arteries and veins exist in the vascular system. All vessels are composed by three distinct layers whose organization is characteristic of a particular type of vessel. The most inner layer called the tunica intima is composed by the vascular endothelium, which acts as a barrier with blood. The tunica media is composed by smooth muscle cells and elastic fibers. This layer performs the vasomotor activity (vasoconstriction or vasodilation) and is regulated by the sympathetic innervation. The most outer layer called the tunica externa is composed principally by collagen fibers to increase interaction with underlying tissues and strengthen vessels. In veins these three strata are in contact whereas in arteries they are separated by the internal and the external elastic lamina. Endothelium is anchored on a basal lamina and the sub-endothelial layer, which is an extracellular matrix (ECM) allowing a mechanical slipping on others structures. The vasoactivity of vessels is critical for the regulation of blood pressure . A vessel is not a “simple pipe”, but a highly dynamic structure imbricated in a proper environment. It allows a precise physiological adaptation to the variations of pH, temperature, mechanical forces or neurosignals. The endothelium can communicate with smooth muscle cells to elaborate a vasoactive answer via endothelium derived relaxing factors (EDRF) such as nitric oxide (NO) and prostaglandin I2 (PGI2) . The production of NO by the endothelium is mediated by endothelium nitric oxide synthase (eNOS) which catalyses NO and L‑citrullin production from L‑arginin. eNOS is initially sequestrated at the plasma membrane by caveolin‑1 and sequentially activated by interactions with partners (Figure 1). The action of calcium (Ca2+) and calmodulin (CaM) activate this enzyme in a calcium-dependent phase. 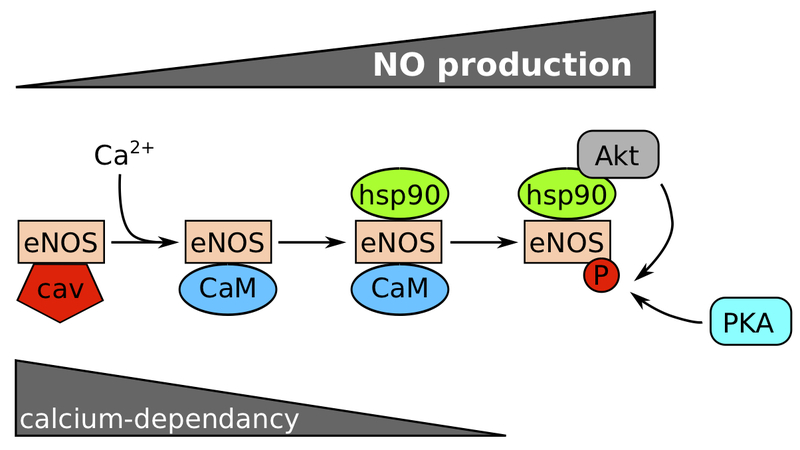 Then, the association with HSP90 protects eNOS against proteosomal degradation, and Akt from phospho-inositide 3-kinase (PI3K) pathway can phosphorylate eNOS on serines in a calcium-independent phase to maintain NO production. PKA is also able to phosphorylate eNOS. If the stimulus is prolonged, eNOS mRNA can be transcribed and stabilized . Figure 1. Calcium and phosphorylation dependence for eNOS activation. Calcium and phosphorylation dependence for eNOS activation. There are different ways to activate this eNOS in endothelial cells. We will first review the mechanical sensing inducing the eNOS activation, then the neuro-sensing inducing the eNOS activation, and finally we will try to evidence a potential cross-talk between these pathways with the impact of the mechanical environment on neuro-sensing. It is well known that mechanical stimuli can enhance eNOS activation via different cellular pathways (see Table 1). Blood pressure, circumferential stretch (tension) and shear stress are the three manifestations of mechanical stress in vessels . Shear stress, the most studied stress, is referenced to activate various mechanical receptors. It is perceived at the apical membrane and can be transmitted into the cell and at the basal membrane via the cytoskeleton. BAEC: Bovin aortic endothelial cells, eNOS: endothelial Nitric Oxide Synthase, FAK: Focal Adhesion Kinase, GPCR: G Protein Coupled Receptor, HAEC: Human Aortic Endothelial Cells, HUVEC: Human Umbilical Vein Endothelial Cells, KCa: calcium activated potassium channel, KIR: inward rectifying potassium channel, MAPK: Mitogen-Activated Protein Kinase, PAK: p21-activated kinase, PI3K: Phosphoinsitide 3-kinase, PKC: Protein Kinase C, RCAEC: rat coronary artery endothelial cells, RTK: Receptor tyrosine kinase, SS: shear stress, TRPV4: Transient Receptor Potential cation channel subfamily V member 4, VEGFR2: Vascular endothelium growth factor Receptor 2. They are invaginated islets of the membrane where lots of receptors and channels are concentrated. The main molecule in these structures is caveolin-1 which is enshrined in the cell membrane and allows deformation. Although its structural role and its capacity to sequestrate eNOS at the plasma membrane , caveolin-1 has been shown as a necessary component to activate the mitogen associated protein kinase (MAPK) / extracellular signal-regulated kinase (ERK) signaling pathway . Moreover, mechano-transduction via β1 integrins also requires these structures . As a consequence, caveolae can be considered as mechano-sensing micro domains, which convert the stress into a signalisation pathway. Vascular endothelium growth factor Receptor 2 (VEGFR2) also known as Fetal Liver Kinase 1 (Flk-1/KDR) has been referenced to act as a mechano-sensor of shear stress. Shear stress can activate the association between Flk1 and Shc, an adaptor protein to mediate a MAPK pathway via Ras . Moreover the MAPK pathway promotes eNOS transcription ••. Shear stress can activate the dimerization of the receptor VEGFR2 by a mechanism which is not understood and bind Src to activate the PI3K pathway too . Chachisvilis et al. showed that the Bradykinin 2 (B2) G Protein Coupled Receptor (GPCR) can be activated by shear stress in a ligand-independent manner via a conformational transition induced by a membrane dynamic process . The link has not been clearly demonstrated yet, but it is well established that B2 receptor activates a phospholipase C (PLC) to increase the intracellular calcium and activate eNOS [11,12]. So we can hypothesize that B2 GPCR activation leads to NO production. Many studies have reported mechanical stress as a way to alter the tensegrity model, which represents the equilibrium conformation of the cytoskeleton. The reorganization of cytoskeleton after mechanical stress induces clustering and activation of many molecules including adhesion complexes such as integrins and cadherins •. The rupture of this tensegrity equilibrium by shear stress can activate two types of junctions: adherens junctions and focal adhesions which link actin network with others cells, and basal membranes. Endothelial adherens junctions are composed by a high variety of proteins including vascular endothelial cadherin, VEGFR2 and Platelet Endothelial Cell Adhesion Molecule 1 (PECAM1). Tzima et al. showed that shear stress is able to activate PECAM1 by phosphorylation, which plays the role of a mechanical transducer to activate Src kinase ••. The action of Src to phosphorylate VEGFR2 is facilitated by vascular endothelial cadherin, which acts as an adaptor. In this context, this RTK can phosphorylate PI3K to activate eNOS. On the other side, focal adhesions are mediated principally by integrins that link the extracellular matrix with the actin network via a protein complex including vinculin, talin, tensin, paxilin and alpha-actinin . Moreover, integrins bind many proteins involved in signaling like focal adhesion kinase (FAK), Src kinase, Fyn kinase and p130. It has been shown that shear stress is able to regulate eNOS mRNA transcription and stabilization. Indeed, shear stress activates rapidly FAK phosphorylation involved in the activation of MAPK / ERK and c-Jun N-terminal kinase (JNK) pathways to promote eNOS transcription [8,16]••. Furthermore, Src is activated by shear stress too and stabilize eNOS mRNA for a longer answer ••. But shear stress has other effects mediated by integrins. Tzima et al. noticed that the activation of αVβ3 integrin in response to blood flow leads to a cytoskeletal alignment in the direction of flow . Shear stress can also activate integrin singling via other intermediate complexes. It is the case of adherens junctions where shear stress activates PI3K and further induces integrins activation depending on the nature of bound ECM protein. It was demonstrated by Orr et al. that on a collagenic matrix, PI3K activates α2β1 integrins, and on a fibronectin substrate it activates αVβ3 and αVβ1 integrins ••. Moreover, the activation of a specific integrin inactivates the other kind of dimer. This suppression is mediated by the activation of Protein kinase A (PKA) by α2β1 integrin which suppresses αVβ3 integrin activation, and Protein Kinase C (PKC) by αVβ3 integrin which suppresses α2β1 integrin activation. This clearly demonstrates that the composition of the ECM influences the cellular answer. In addition, shear stress is able to activate p21-activated kinase (PAK) in cells grown on a fibronectin substrate via Rac/Cdc42 but not on collagen. PAK activates the Nuclear Factor-kappaB (NF-kappaB) transcription factor known to activate pro-inflammatory genes, and to increase permeability and eNOS transcription [19,20]. Moreover, (PKA) stimulated by integrins in contact with collagen inhibits the activation of PAK and so of NF-kappaB [19,21]. It was also shown that the flow-induced vasodilation is highly decreased when α1β1 integrins are blocked by an anti-α1β1 antibody. These integrins, which bind collagen and laminin are sensitive to shear stress and activate eNOS via a PI3K/Akt pathway . Different components associated with the plasma membrane such as glycocalyx and isolated G-proteins can play a role of mechano-transducer. Glycocalyx is a cell coat including lots of molecules: glycoproteins such as sialic acids (SA), proteoglycans and glycosaminoglycan such as heparan sulfate (HS), chondroitin sulfate (CS) and hyaluronic acid (HA). Specific degradation of HS, HA or SA results in a loss of the shear stress-induced NO production. As the glycocalyx is connected with the cytoskeleton, authors proposed that shear stress could be able to alter the tensegrity equilibrium via glycocalyx mechano-activation [23,24]•. Isolated G-protein has been also reported as a potent role for shear stress transduction. Indeed, it is known that isolated G-proteins are found at the plasma membrane. Normally inactive because of the absence of receptor, Gudi et al. showed that shear stress can activate these proteins . Shear stress can change membrane proprieties by decreasing micro-viscosity and increasing fluidity. This leads to a different lipid dynamic able to isolated G-protein independently of a receptor. G-proteins are involved in lots of pathway to increase NO production, so we can assume that the activation of these isolated proteins can lead to the same result. The activation of Ion channels in a context of shear stress acts at different moments. They can be activated directly by shear stress such as Transient Receptor Potential cation channel subfamily V member 4 (TRPV4), or after an intracellular calcium increase. TRPV4 channels can be activated by shear stress to allow the entrance of extracellular calcium . This influx participates at the activation of eNOS on a calcium-dependent phase and activates calcium activated potassium channel (KCa), which allows K+ exit. This outward leads to a hyper-polarization of the cellular membrane, which increases both conductance of inward rectifying potassium channel (Kir) and the opening of calcium channels sensitive to the hyper-polarization. The opening of Kir channels increases the hyper-polarization which auto-amplifies the phenomenon. Moreover, shear stress increases the opening probability of Kir channels. In parallel, outward rectifying chloride channel are open just after potassium channels, probably to maintain the polarization of the plasma membrane. Calcium can be delivered by the endoplasmic reticulum too, for example after the action of PKA which is implied in lots of pathways [3,27,28]. Barakat et al. showed that shear stress can be transmitted by different ways from vessel lumen to endothelial cells. Flow can directly activate channels at the plasma membrane; but it can deform this membrane too, which transmits this stress to channels. Cytoskeleton, after shear stress forces can modulate the activity of this channels too . A particularly interesting finding is the fact that TRPV4, which was described to answer to shear stress, is also able to answer to acetylcholine (Ach) ••. This activation by a neuropeptide is mediated by a pathway including a GPCR to sense Ach and a PKC alpha to transduce the information ••. This observation led us to think that it could exist an interaction between mechanical and neuro-sensing by the endothelial cell to induce NO production. A vessel is a structure integrated in the organism. As a consequence, it communicates with others organs via lots of molecules such as neuropeptides, cytokines and chemokines. Molecules arrive via the blood flow or by sympathetic nerves from the tunica media. Here, we review the neuropeptides which lead to eNOS activation and the NO production (see Table 2). 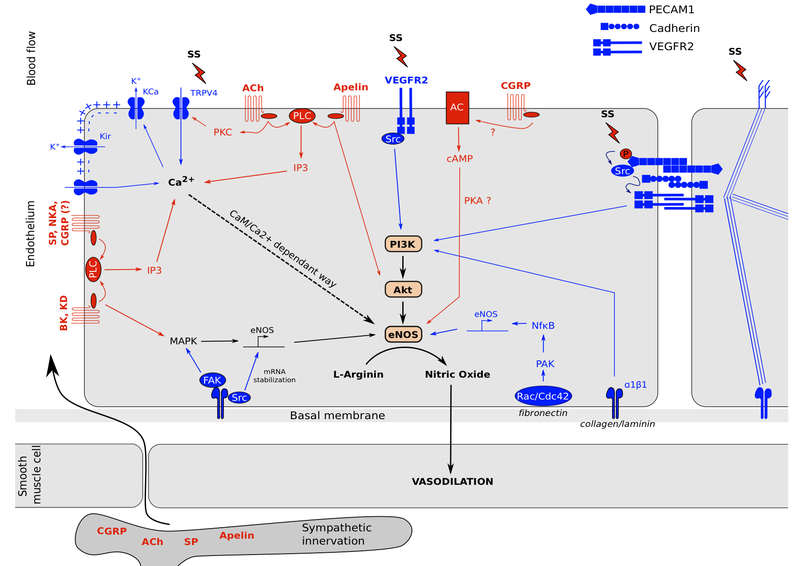 AC: Adenylate cyclase, AMPK: AMP Activated Protein Kinase, CGRP(-R): Calcitonin Gene Related Peptide (-Receptor), CRLR: Calcitonin receptor-Like Receptor, GPCR: G Protein Coupled Receptor, HUVEC: Human Umbilical Vein Endothelial Cells, IP3: inositol 1,4,5-trisphosphate, MAPK: Mitotgen-Activated Protein Kinase, NK1: Neurokinin-1 Receptor, NKA: Neurokinin A, PI3K: Phosphoinsitide 3-kinase, PKA: Protein Kinase A, PKC: Protein Kinase C, PLC: Phospholipase C, RAMP1: Receptor Activity-Modifying Protein 1, TRPV4: Transient Receptor Potential cation channel subfamily V member 4. Whereas acetylcholin (Ach) acts as a vasocontrictor in the absence of endothelium, it promotes a vasodilation via an EDRF when it is perceived by the endothelial cell. Ach, which is commonly considered as a neuropeptide, acts via a muscarinic receptor on the endothelium. The binding of this receptor leads to a conformational change which activates a Gq protein coupled with a muscarinic receptor. Gq-α subunit is known to activate a PLC which produces inositol 1,4,5-trisphosphate (IP3) and diacylglycerol (DAG) from the hydrolysis of phosphatidylinositol 4,5-bisphosphate (PIP2). IP3 can bind the IP3-Receptor on the endoplasmic reticulum membrane to release Ca2+ and further activate CaM and eNOS to produce nitric oxide . CGRP was identified in 1983 as a neuropeptide . Two years after, it was described as a potent vasodilator implied in inflammatory reactions . CGRP can be released by the sympathetic innervation and picked up at the membrane of endothelial cells to transmit a nervous message. CGRP is able to bind CGRP-Receptor which is composed by two molecules: a GPCR with seven transmembrane domains called Calcitonin receptor-Like Receptor (CRLR) associated with the Receptor Activity-Modifying Protein 1 (RAMP1). A CRLR not associated with RAMP cannot work as a functional CGRP receptor [35,36]. It appears that CGRP could act via two distinct ways following the activation of a GPCR. The binding of the receptor favors the exchange of a GDP for a GTP on α subunit to activate targets. The first way, which is not clearly demonstrated, is a PLC-dependent pathway activating a CaM/Ca2+-dependent NO production as described for Ach. Evidences shows that the activation of the CGRP receptor can activate adenylate cyclase at the plasma membrane by the βγ subunits. This enzyme is able to transform ATP into cAMP which increases in concentration and leads to the activation of PKA also known as cAMP dependent protein kinase (cAK). PKA can activates AMPK which is probably the intermediate that allows eNOS phosphorylation and its activation in a CaM/Ca2+ independent way [36–38]••. Substance P (SP) is a neuropeptide from trachykinin family which acts at different levels. It is particularly important for the automatic nervous system and the regulation of cardio-respiratory system. It is known to be a strong vasodilator. SP is delivered by the sympathetic innervation and acts on endothelial cells via the Neurokinin-1 Receptor (NK1-R). This NK1-R is a GqPCR which activates PLC and increases the level of eNOS activity via a Ca2+/CaM-dependent manner . Neurokinin A, another peptide of trachykynin family, can bind NK1-R too, but with a lower affinity. It is a neuropeptide identified in 1998 by Tatemoto et al. . It can be found in blood circulation and is implied in lots of physiological regulations such as blood pressure decrease. Apelin acts on the endothelial cell surface via APJ receptor which is a GPCR. The activation of GqPCR activates PLC via its α subunit to increase eNOS activity via calcium as described previously, whereas GiPCR activates Akt pathway by phosphorylation. This active form of Akt phosphorylates eNOS to highly increase its activity . We saw in the two previous parts mechano- and neuro-sensing by the endothelial cell which lead to the production of NO and relax the underlying smooth muscle cells (Figure 2). It showed us that endothelium is a highly active structure which communicates with its environment. Endothelial cells are exposed to various stimuli. Cell surface perceives mechanical tensions by membrane proprieties changes and glycocalyx movement linked to cytoskeleton. These mechanisms lead to (1): the activation of ion channels such as TRPV4 which increases its Ca2+ permeability. This intracellular Ca2+ concentration increase leads to the opening of KCa channels to promotes a membrane hyper-polarization and open KIR and calcium channels to further Ca2+ entry which activates eNOS in a CaM/Ca2+ dependent way. (2): receptor complexes clusterization such as VEGFR2 which activates PI3K and MAPK pathways, adherens junctions activation which leads to PI3K activation and new ECM-integrin bounds depending of ECM composition, and focal adhesions activation which leads to MAPK signaling, NFκB signaling and eNOS mRNA stabilization. Moreover, neuropeptides from blood circulation or sympathetic innervation can induce intracellular signals to activate eNOS via G Proteins Coupled receptors. Acetylcholin, Bradykinin, Kallidin, Apelin, Substance P, Neurokinin A and probably CGRP are able to activate Phospholipase C which increase intracellular calcium concentration to activates eNOS in a CaM/Ca2+-dependent way. Bradykinin and Kallidin can activates MAPK pathway too and Acetylcholin in able to mediate TRPV4 channels opening via Protein Kinase C. Apelin in able to induce a direct Akt phosphorylation and CGRP has been reported to activate the Adenylate Cyclase which increase Protein Kinase A activity to induce eNOS activation via AMPK. It is interesting to notice the variability and the similarities of signal transduction mechanisms between the two types of reception. For neuro-sensing, all pathways tend to converge on intracellular calcium increase to activate eNOS in a CaM/Ca2+ dependent manner. Only apelin was referenced to act in part on Akt by promoting its phosphorylation, and CGRP which activates eNOS via PKA in a CaM/Ca2+ independent way. Moreover, only GPCRs were referenced to sense a neuropeptide and transduce an intracellular signal principally via PLC as an intermediate of transduction. Complementary, for mechano-sensing there is much more mechanisms implying eNOS activation, transcription and its mRNA stabilization. They tend to PI3K phosphorylation and intracellular Ca2+ increase. As described in figure 2, because of the different ways engaged, we can expect a different response in term of amplitude and rapidity of NO production. Indeed, even if different pathways co-exist, a cell exposed to mechanical stress activates rapidly PI3K/Akt pathway to promote NO synthesis and smooth muscle cell relaxation. If the stimulus is maintain for a longer period, there is eNOS mRNA transcription via MAPK and NFκB. For a neuropeptide response, there is only one pathway engaged, which is proportional at the intracellular calcium concentration. The pathway is activated as long as the receptor is engaged with its ligand. This allows a rapid switch between activation and inhibition of eNOS. Even for neuropeptides, the quick reversibility of the response is modulated as observed for BK and KD which are able to activate both calcium concentration increase and MAPK to stimulate eNOS mRNA transcription. Another thing we can remark is the importance of cytoskeleton for mechano-sensing. Shear stress induces a break of the tensegrity equilibrium, which allows clusterization of signaling complexes (such as adherens junctions, focal adhesions and RTK dimerization) and the opening of ion channels. On the opposite, neuro-sensing seems independent of cytoskeleton in term of stress transduction. Although great differences exist regarding the pathway engaged and the type of reception, these observations show the presence of some common intermediaries between mechano- and neuro-sensing consistent with a potential cross-talk. Indeed, some evidences in the scientific literature show that the two phenomenons described previously can act together. As we described previously, TRPV4 channels can be activated both by shear stress and acetylcholin [30,31]. It shows us that two types of stress which are perceived by two types of receptor can converge via the same protein. We can hypothesize that the activation of one way modulates the activation of the other. Another illustration of this potential cross-talk between mechano- and neuro-sensing is the pressure-induced vasodilation (PIV) ••. An external pressure on skin activates a neuron circuit set into dermis. The consequence is he transduction of a nociceptive information via capsaicin-sensitive fibers to spinal cord. As a consequence, a nervous message is elaborated in the central nervous system and re-sent to periphery by the sympathetic innervation in the tunica media of vessel walls. The neuronal-secreted transducer is the CGRP neuro-peptide, which acts on endothelium to induce a pathway leading to eNOS activation. NO produced by eNOS then induces smooth muscle cell relaxation and vessel vasodilation. In summary, a mechanical information is converted into a nervous message, which acts locally to induce a vasodilation. This vasodilation is a physiological response to prevent ischemia linked to a stronger pressure: it is the PIV phenomenon . The question we could address is: “is the integrity of the extracellular matrix can be reflected by the ability of PIV?“. We must keep in mind that only vasodilator signals were presented here, however there are lots of vasocontrictor signals too. As a consequence, vessels are in a permanent equilibrium to maintain a good physiological blood pressure and local irrigation. I thank Dr Romain Debret and Dr Laurent Viriot for their help and their advices concerning this review. 1. Marieb EN, Hoehn K: Human Anatomy & Physiology, 8th Edition . Benjamin Cummings; 2009. 5. Park H, Go Y-M, Darji R, Choi J-W, Lisanti MP, Maland MC, Jo H: Caveolin-1 regulates shear stress-dependent activation of extracellular signal-regulated kinase . Am J Physiol Heart Circ Physiol 2000, 278 :H1285–H1293. ●● This paper shows that shear stress can activate c-Src to promotes on the one hand eNOS transcription via ERK pathway and on the other hand eNOS mRNA stabilization. ● This paper shows by physical methods that shear stress change the tensegrity equilibrium of endothelial cells and via this mechanism induced the clusterization of signaling complexes. ●● This paper shows that a molecular complex is located at the adherens junction and composed by PCAM1, VE- Cad and VEGFR2. Moreover, it can act in the context of shear stress as a mechanosensor complex which favours PI3K activation. ●● This paper demonstrates that shear stress is able to activate FAK kinase on focal adhesions and promotes both ERK and JNK activation via a Grb2/SoS complex. ●● This paper demonstrates the importance of the sub- endothelial extracellular matrix composition to promotes a specific integrin response. Moreover, the activation of a specific kind of integrins is able to inhibit the others. 20. Ando J, Yamamoto K: Vascular mechanobiology . Circulation Journal 2009, 73 :1983–1992. ● This paper shows the importance for shear stress transduction of the glycocalyx integrity. To demonstrate this, the authors removes specifically different surface proteins. 25. Gudi S, Nolan JP, Frangos JA: Modulation of GTPase activity of G proteins by fluid shear stress and phospholipid composition . Proceedings of the National Academy of Sciences of the United States of America 1998, 95 :2515. 27. Gautam M, Gojova A, Barakat AI: Flow-activated ion channels in vascular endothelium . Cell biochemistry and biophysics 2006, 46 :277–284. ●● This paper is the first which identifies an invivo link between a vasodilation mediated by acetylcholine and TRPV4 channels involved in mechanosensing. ●● This paper is one of the first which identify a link between a neuromediator (acetylcholine) and a receptor known as a mechanosensor (TRPV4) in the goal to activate eNOS. By calcium measurement, they identify the pathway Ach- PKCa-TRPV4. ●● This paper consolidate the hypothesis of PKC implication under CGRP perception. Moreover, they integrate the AMPK as a novel intermediate in the CGRP-PKA-eNOS pathway. ●● By using in vivo methods, this article was the first to describe the pathway of pressure induced-vasodilation. It includes the CGRP as a central neuropeptide to promote the physiologic vasodilatory reflex.